I am happy to share by Spring 2017 course syllabi. Enjoy! In this summer’s session of born-digital archives, students have been working on a born-digital archives project, which includes working with records on obsolete media (5.25 diskettes, 3.5 floppies, Zip disks, Mini DV tapes, etc.) as well as inactive records on network storage which originate in a variety of antiquated file formats (e.g., WordPerfect, email in MS Outlook Express format, etc.). 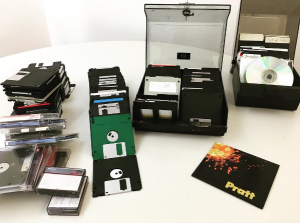 Students are divided into three teams to tackle the project: a Digital Forensics team (working primarily with obsolete media), a Digital Preservation team (working primarily with format migration), and Curation and Description (working primarily on appraisal, arrangement and description). 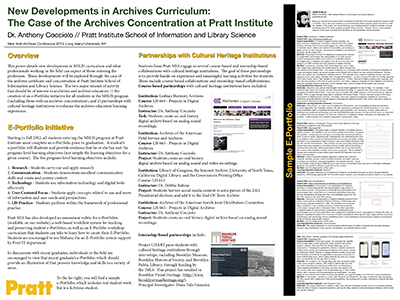 The collection comes from Pratt School of Information’s own files, and will eventually become available through the School’s on-site archives. More information can be found in the course syllabus. This semester is off to a nice start. In LIS 665 Projects in Digital Archives, students will be working to arrange, describe and digitize portions of a collection of architectural photography (with some landscape and craft photography) donated to the School by the estate of Bill Maris. You can checkout the finding aid created by students last Fall here. 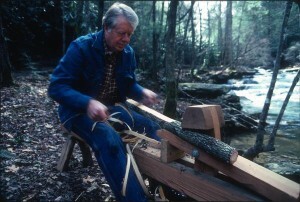 One of Maris’ digitized photograph is shown here, depicting President Jimmy Carter making furniture. Hello there. So this summer I will be teaching Projects in Digital Archives for a fifth year in a row. This semester, we will be working with a selection of personal materials from Ms. Liza Loop. Ms. Loop is looking to create the History of Computing in Learning and Education (HCLE) Virtual Museum, and has worked her career in Silicon Valley’s computing industry with an interest in uses of computing for education and learning. The collection that we will be working with is both born-digital and analog: 5.25 floppy disk, 3.5 floppy disks, Hi8 video and Betamax video (which is the bulk). Our goal is re-animate these materials using methods relevant to a modern archival environment (e.g., digitizing analog material, imaging obsolete media, making it intelligible/runnable, etc. ), and providing value to the HCLE initiative. 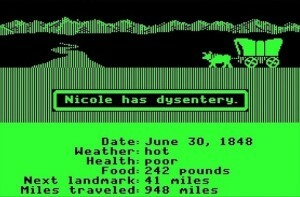 Although we will not be working with the Oregon Trail (screenshot above), it is one of the more well known and often remembered educational games. I also remember playing a lot of Number Munchers…. and Carmen Sandiego (all on the Apple IIe, which may mean that I am really old or that my school was slow to adopt new technology, or both). You can also download the course syllabus (PDF). Happy 2015. I thought I would share some of what I have planned for teaching this semester. In LIS 665 Projects in Digital Archives, the class-wide project is to continue working to digitize, curate, and make accessible the photos from the Bill Maris architectural collection, which were donated a few years ago to Pratt. 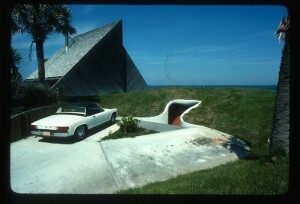 This collection includes architectural photos from the 1970s, including many gems like the Morgan House shown above (photographed by Maris in 1976). The goal is to launch the site by the end of the semester. In LIS 668 Projects in Moving Image and Sound Archives, the class-wide project is to finish up digitizing, curating, and making accessible the Daughters of Bilitis Oral History Project. Also, we are hoping to start work on a collection of materials related to Act Up that is housed at the Lesbian Herstory Archives. Hello World. This semester I am teaching three classes: 2 sections of Projects in Digital Archives, and Projects in Moving Image and Sound Archiving. For the Wednesday section of Projects in Digital Archives, the class will be working with my colleagues Susan Malbin and Christine McEvilly from the American Jewish Historical Society to incorporate new material into their portal, Jews in America. We will also be working on arranging, describing, and digitizing materials from an architectural photographer that were donated to the Institute. For my Thursday section of Projects in Digital Archives, we are continuing on a collaboration with Pedro Juan Hernandez of the Archvies of Centro de Estudios Puertorriqueños (CENTRO) at Hunter College / CUNY, to enhance a digitized audio archive. And lastly, in Projects in Moving Image and Sound Archiving, the class will continue a partnership with the Lesbian Herstory Archvies by continuing to digitize the video collection for the Daughters of Bilitis Oral History Project. I would venture to say that this website has become the largest digitized audio archive related to lesbians and lesbian communities. This semester, I will be teaching Projects in Digital Archives (LIS 665) with a new project partner: Centro de Estudios Puertorriqueños (or the Center for Puerto Rican Studies at Hunter College / CUNY). In the class, we will be working to assemble a digital archive of oral histories from their collection. 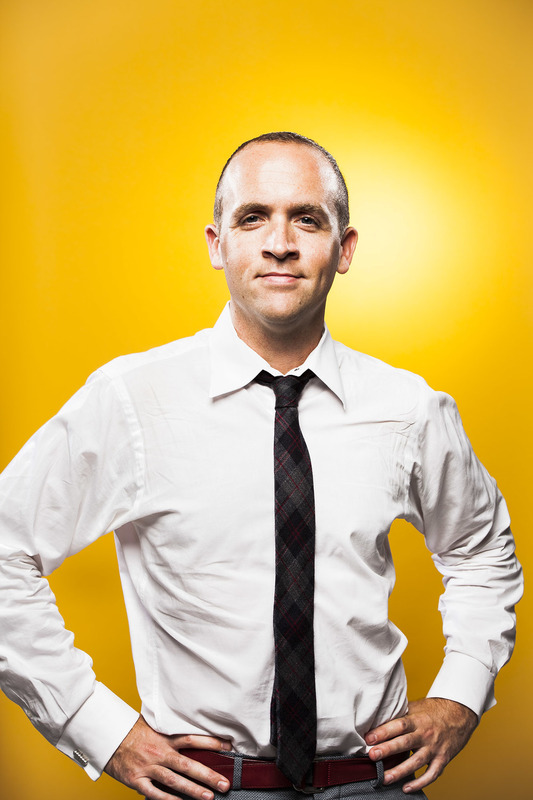 I am excited to be branching out into new areas, and hope the students will enjoy the collaboration as well. I will also be teaching Projects in Moving Image and Sound Archiving (LIS 668), where the class will continue work on a video oral history project started last semester in collaboration with the Lesbian Herstory Archives. Spring 2013 classes have started (early, I know) and I thought I’d share my syllabi. 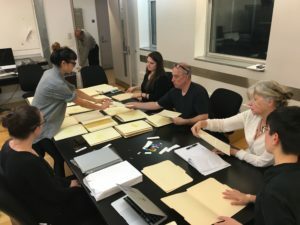 This semester, in Projects in Digital Archives, we will be again working with the Archives of the American Joint Jewish Distribution (JDC) and the dance critic Barbara Newman. In Digital Libraries, students will be working on creating new digital libraries and designing a funding campaign through Kickstarter. We will be using the NDSA collection of Kickstarter projects as inspiration for the projects we will be creating this semester. Should be fun! I am super happy to be the recipient of the Pratt Severn Faculty Innovation Award, sponsored by ALISE and Pratt. The award is for innovative uses of information technology in MSLIS curriculum. 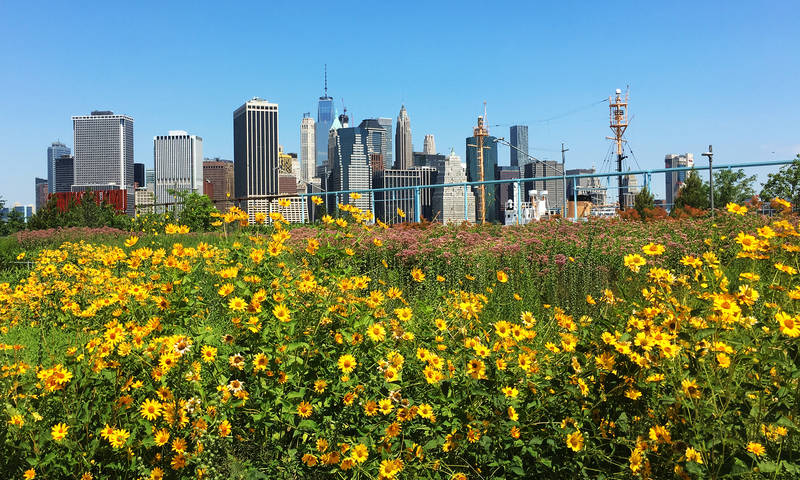 I am grateful to all the folks–especially those at Teachers College–for getting me (and other students) to think about how to incorporate IT in education in a meaningful way. One of the other great things about the award is that it was setup by a 1968 Pratt SILS alumni, David Severn, which makes it extra special. Thank you to all who made this award possible.